While the human race has made significant advancements in the last few centuries, I think we still have a lot of evolving to do. I’m reminded of this whenever I pull up to a stoplight and see the driver next to me texting. "What an idiot,” I think, until I get to the next stoplight and feel myself unconsciously reaching for my own phone. I would guess that many of us grapple with this powerful compulsion to fill every moment with a productive activity, but it’s a ruse. It actually makes us less productive. It also makes us crappy drivers. It’s a myth that we can do two things at once. Psychology research has proven that the human brain can only accomplish one cognitively complicated task at a time. There is only one neural channel through which complex processing flows. It is humanly impossible to have a conversation and read a book at the same time. You can’t simultaneously respond to your colleague’s email while talking on the phone with your client about their needs. (Nice try though.) 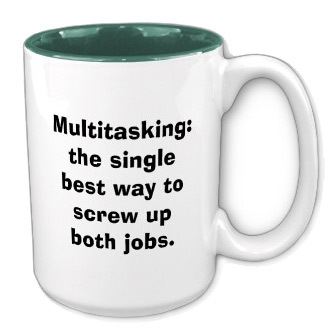 You may think you’re multitasking, but in fact you are switching back and forth between two cognitive functions. And according to Psychology Today, task switching impairs productivity by an average of 40%. Think about it. Each task switch might waste only 1/10th of a second, but if you do it several times a minute, you lose considerable focus and efficacy by the end of the day. So, rather than channel your desire to be more productive into the decidedly unproductive behavior of multitasking, recapture your full potential with this thing called concentration. Practice uni-tasking. Do one thing at a time. It will help you regain all that time you’ve lost trying to shove twelve hours of work into an eight hour day.